The long-awaited B-Spec Tune dyno results are now here! We apologize that it took so long, but we wanted to make sure our baseline and B-Spec Tune dyno were as accurate as possible under consistent and unbiased conditions. We appreciate your patience and would like to use this opportunity to provide an extensive explanation of the tune and differences between dynos. Personally, we’ve (Andrew and I) been running our tunes for 5+ years now with a handful of track days and over 80k miles of combined daily driving with zero tune-related issues. Some of you may know that I started tuning with a few of the members from the M3Forum Tuning & Coding section as a small project, but it grew in popularity. Since then we’ve partnered up with Martyn from ECUWorx to develop some features into his program such as our Exhaust Backfire Tune. Today, we are providing our own off-the-shelf (OTS) tune for the E46 M3. Buildjournal’s B-Spec Tune is most known for the additional gains in the mid-range of the powerband compared to the stock tune. Our philosophy with the B-Spec Tune to bring a safe, reliable tune to the market that expands on the ultimate driving experience that the E46 M3 already provides. The goal of the B-Spec Tune is to improve driveability and performance – not maximum power. Andrew’s car, the white 2003 BMW E46 M3 6MT, was the test vehicle for both baseline and B-Spec Tune dyno runs. It has over 170K miles and is a testament to the importance of being diligent with vehicle maintenance. On the stock run, it put down a respectable 285 whp and 245 wtq – very reasonable with stock headers, factory stock tune, aftermarket exhaust + resonator, and (crappy) California 91 octane. For the tuned run, Andrew had Evosport headers installed by our friends, Casey and Daniel, at Racewerkz Engineering in Burbank, CA. As you may know, the gains from the B-Spec Tune are maximized when combined with aftermarket headers. The stock catalytic converters is a definite bottleneck in which we see subdued gains compared paired with headers. This is especially the case with naturally aspirated cars especially after opening up throttle plates to full open. Most tuners for the E46 M3 would agree that the stock header design is simply too restrictive and prevents the car from taking full advantage of a tune at the higher end of the power band. That being said, a flash tune on a stock header system still yields some power gains mostly in the mid range. The facility we chose to do our B-Spec Tune dyno testing was at European Auto Source, a very well respected and reputable BMW shop in Orange County, Southern California. Steve at EAS was our dyno operator for all runs to ensure consistency. The dyno at EAS is a Dynojet 224xLC. For consistency purposes – we tried our best to do these runs under the same environmental conditions. Despite California’s recent climate swings, we were able to manage scheduling both runs with an ambient temperature of about 80°F. A dynamometer, or “dyno” for short, is a device for measuring force, moment of force (torque), or power. In this case – we did two dyno runs: baseline and tuned. The difference between these two runs show the gains that the tune and headers provides. Please keep in mind that not all dynos read the same – dyno model, ambient temperature, elevation, humidity, and many other factors play a role in a dyno’s reading. Usually, the first numbers you will see on a dyno graph are the “peak numbers” or the “max hp/tq”. While most will initially look for peak-to-peak gains – this is not what we are focused on. To measure the true performance gains, the important numbers to examine are the deltas (Δ), or actual changes/differences throughout the powerbands of the stock and B-Spec Tune dyno runs. This chart shows the difference between a stock tune and the B-Spec tune while displaying peak-to-peak and change in delta. You might be wondering – why is the torque gain so low? Although it is fun to compare max hp and torque, we often forget about the importance of a usable powerband. Comparing peak-to-peak gains do not truly measure the performance a tune adds. As mentioned before, what we need to focus on is the delta between the curves. For a performance tune, you want to have the most delta over certain areas of the powerband and extend that delta as much as possible. Some tunes will try to go for the max horsepower or max torque but sacrifice the powerband to do so. With this in mind – we can move on to analyzing the data. You can see that at the lower RPMs there is not much difference in the power and torque, this is deliberate as we feel that everyday driving should be kept to OEM feel. We do not modify many parameters in this section of the powerband as there is not much to improve on in our opinion. That being said, we may revisit this area to see if we can improve this area in the future with updated versions (v2). One important thing that you may notice that there is one slight fluctuation in power between 3.7k to 4.5k RPM. This is due the fact that Andrew’s headers is missing one bolt which created an exhaust leak. Unfortunately, header fitment was not ideal during installation, but we did not have time to fix the issue prior to the scheduled B-Spec Tune dyno session. The O2 bung covered up the header bolt flange, preventing the bolt from securing the header to the section 1. As you can see, there is no dip in the stock run since the stock headers did not have this problem. However, once RPMs went up, it seemed to have sealed up the leak and performed normally. The mid-to-upper range is where we can see the significant differences between the stock tune and our B-Spec Tune over the entire powerband. This range of RPM is where track cars live and depend on. Notice that the stock tune falls flat at about 4.7K RPM – the range of RPM when you begin to feel the power tailoring off. This is the area where improvement was needed and where we concentrated most of our tuning efforts on. Through a combination of throttle body openings, vanos, fueling, advancing ignition timing, calibrating the knock sensors and more, we were able to maximize these gains in this section of the powerband. Starting at about 5.5k RPMs, you can see the noticeable height difference between the two lines, and in power. Looking closely, you will also see that the stock curve ends at 8,000 RPM while the B-Spec Tune curves continues to 8,100 RPM. We raised the rev limiter from the stock 8,000 RPM to 8,100 RPM on B-Spec Tune and accounted for the additional raised RPM. Many tunes simply raise the redline but do not tune for the additional power. 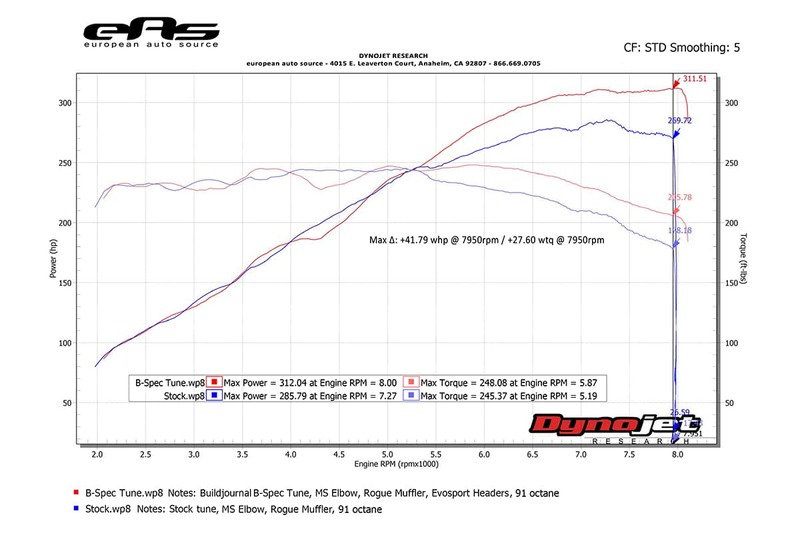 You can see that the B-Spec Tune continues to make power even past the stock 8,000 redline with a peak value of 312 whp. If the raised rev limiter is not accounted for in tuning, the car attempts to guess what the missing values should be through interpolation. Another thing to notice in the stock run are the rough lines near the 7.5K RPM range – this is because the DME pulls some timing in order to avoid knock. The factory knock sensors are overly conservative so we loosened up the knock sensitivity to avoid pulling timing. You can see that this the roughness in the lines were smoothed out in the tuned run. To put it all together, you’re looking at an average delta/gain of 24.68 whp and 18.95 wtq across the powerband. We draw attention to the average numbers because looking at just the min and max values can be misleading – you’re not just getting a 2wtq or 41whp gain, but rather a distributed power gain in the mid and upper rpm range. Additional gains may be seen in areas with higher octane fuel. Take these numbers how you may, but these are the real power gains you can use, feel, and show faster lap times with. At the end of the day, we are very pleased with our B-Spec Tune dyno results (despite horrible CA gas) and proud to be able to offer a reliable yet affordable tune to the rest of the community. Again, our goal here is not to make max horsepower and torque, but to improve the overall driving experience of the renowned E46 M3. If you are interested in purchasing our B-Spec Tune you can purchase it from our Tuning Labs online store. Going forward, we expect to make some improvements to our tune as we continue to test and make adjustments to the tune as necessary. We are pleased to announce that Buildjournal will be providing free file updates for existing and future customers, both remotely and locally. New customers will automatically receive the most updated version of the tune unless otherwise specified. That being said, we will have an update to release in the near future – existing customers will receive an email from us so look out for it! Unfortunately this means we will be raising the price for the B-Spec Tune to $279 starting November 28, 2017 after Cyber Monday. Lastly, we would like to thank all of our followers, customers, partners and friends for all the support we have received so far and in the future. Many of you may not know, but we are just a few BMW enthusiasts with full-time jobs. Buildjournal started off as this car’s “build journal” but has come to grow as a platform to share information and become a resource for all things E46 M3 related. We are always looking for new ideas for to create more content and guides, so please feel free to email us with suggestions on what articles you would like to see.